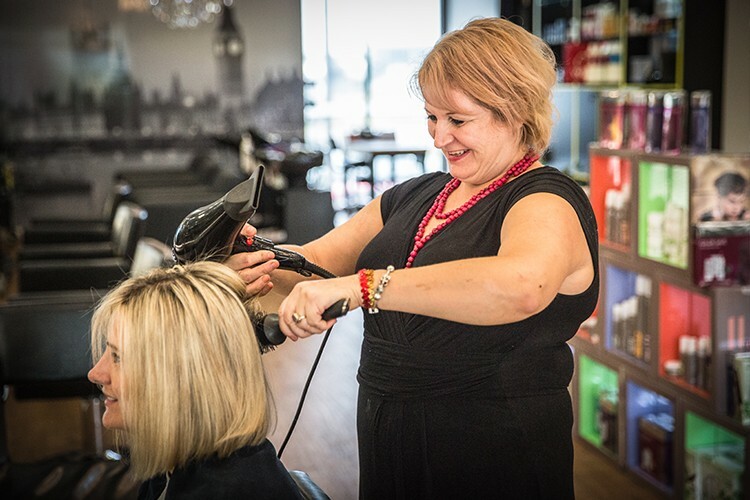 Throughout her hairdressing career, Amanda has always gone above and beyond to help people look and feel their best. It’s that talent (did you she was trained by Princess Di’s personal hairdresser? ), combined with her bubbly personality that has led the charismatic Amanda to style the likes of Twiggy and Ozzie Osbourne! It’s not all style and glamour for Amanda though. She’s also always looking for ways to contribute to the community she loves so dearly. Whether it’s building up young teens’ self confidence through the Shine program, hosting young Guides and Brownies, or donating hair to cancer patients, Amanda is always giving back. Well, what are you waiting for? Let’s meet Amanda! Hi Amanda, thanks for taking the time to chat with us. What’s the story behind Amanda Hair Design? I started my hairdressing career over 30 years ago. I was fortunate to complete my apprenticeship with a well-respected and renowned hair-colouring salon in the heart of London – Daniel Galvin Hair Colour Consultants. I achieved a degree in education and worked for TONI&GUY as an educator to the salon apprentices. This role included going into different salon locations in London to deliver the City and Guilds Education program and assess students to meet performance criterion (similar to the Cert III offered here in Australia). After several years, I moved into a role at a college to become a full-time hairdressing lecturer, where I was responsible for delivering the theory and practical aspects of hairdressing. The Sunshine Coast became my new home in 2008, where I found a gap in the market around the skill level and training in local hair salons and with the education for the youth in the area. In 2010, I opened my first salon and entered various hair awards with a well-known product company – Keune. I won the highly commended award 2 years running and then entered the Sunshine Coast Business Awards, where I was finalist 2 years in a row. Since then, we relocated to a much larger premises in a newly developed area within the Sunshine Coast, with the desire to one day in the future open a training academy in my salon. The community. My salon contributes a lot to charity by being active in the community. We’ve held events including the Shine program, which is delivered at high schools, and focuses on teaching teenagers how to care for their hair and skin and give them self confidence. I have also had the Brownie and Guide groups in the salon for some fun interactive training sessions; they really enjoyed this and I have been asked to host it again. We collect hair for the Beautiful Lengths charity – the hair is used to make wigs for people that have lost their hair due to cancer and some young children who suffer from alopecia. I also donate products and vouchers to various school groups to help. It’s fantastic to hear how you’re giving back to the community! What made you want to start your own small business? The goal is to one day in the future open a training academy in my own salon. Relocating to the Sunshine Coast meant building the business up again with new clients. My current team consists of myself and a full-time stylist, Louis, and part-time apprentices, Keren and Ben. Is there any service Amanda Hair Design is particularly famous for or that your regulars love? We put a strong focus on hair colouring as our specialty. How do you go over and above to create a salon experience that people love coming back to? We only use high-quality Wella and Sebastian products, and our mission is to deliver a 5-star experience for the client, every time. Consistency is what we are constantly striving for. Employees at Amanda Hair Design are constantly developing and gaining a sense of achievement and job satisfaction, which helps them to be more confident with customers and gives better client satisfaction. This also helps them to enjoy their role, which in turn gives them more passion to succeed. We all know that great client satisfaction is driven from consistent delivery of expected service. This only happens when employees are engaged and aligned with the vision of the salon. I believe that our training initiatives are part of the engagement process, and therefore, client satisfaction and loyalty. Do you have any advice for other small businesses who are starting up? Do your research thoroughly on the area, your target audience and your competitors. One of the 5 star reviews on your listing says, “Everyone is asking me where I got my hair done??! The colour is fab…I am so glad I found you Amanda. You and your team are really special.” Locals supporting locals is something we really believe in. How valuable have you found online reviews and feedback to you as a local business? It’s valuable because it helps people gain trust in us and brings more business through the door. Speaking of feedback, Amanda Hair design does a really great job at getting online reviews. What advice do you have for other local businesses who might want to increase their online reviews on platforms like True Local? Just to ask your clients/customers to write a review or let them know that it helps you as a small business owner to grow your business. Simple but effective. It’s also important for small businesses to have the support and recommendations of the locals to boost the community. As a small business, what are your favourite local businesses in the Sunshine Coast area? We work closely with the Bloomhill Op Shop, supporting them by donating money to them and they lend us clothes, etc. for our hair shows. Lastly, for a bit of fun – what’s one quirky fact about Amanda Hair Design people might not know? I’ve worked with a lot of celebrities like Ozzie Osborne, David Jason and Twiggy to name a few and was trained by Princess Diana’s hairdresser.